One of the first lots sold when Peter Palsel had the town of New Market laid out in 1783. Deed Book E p 269, dated 25 April 1785. "Peter Palsel to Reuben Moore £200 one certain lot or half acre situate lying and being in the Town of Newmarket. One of the first lots sold when Peter Palsel had the town of New Market laid out in 1783. Deed Book E p 269, dated 25 April 1785. "Peter Palsel to Reuben Moore £200 one certain lot or half acre situate lying and being in the Town of Newmarket in the County of Shenando which said lot is known as and distinguished by number Thirty two as by a plan of the said Town surveyed and made by Mr Jacob Rinker may more fully appear." oldest son and first child of Rev Paul Henkel (1754-1825.) 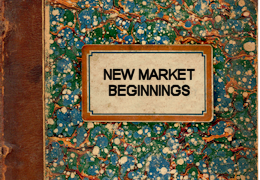 Within his nearly seventy years, he accomplished much and left an indelible mark on New Market and its development. Currently operated as Shop Civil War, a wholesale and retail business, this building stands on the southern half of Lot 31. The Stirewalt family lived in it from 1838 to 1978.
extracted from Introduction of the Transcripts made by Gloria Neiger Bushong of Mattie's diaries from 1900 until she died in 1955.
extracted from Introduction of the Transcripts made by Gloria Neiger Bushong of Mattie's diaries from 1900 until she died in 1955. These two volumes can be viewed in their entirety at either the New Market Library, or the Shenandoah County Library Reference Section, or Bridgewater College, Virginia. This house is built on the southern half of Lot 30 and is currently the offices of James P. Weissenborn, Attorney at Law. This house is built on the southern half of Lot 30 and is currently the offices of James P. Weissenborn, Attorney at Law. On this site was established one of the earliest potteries in New Market when Christian Adams purchased the site in 1818. "the Angel of the Shenandoah" An article written by Susan Smith. This home is built on Lot 42 of the original town lots, mapped out by Colonel Jacob Rinker in 1785 and extended after 1786. This home is built on Lot 42 of the original town lots, mapped out by Colonel Jacob Rinker in 1785 and extended after 1786. The 1/2 acre lot was divided into two 1/4 acre lots and this home is built on the northern half. It was sold by Abraham Savage to William Menefee in 1804, Deed Book O, page 103, Shenandoah County Records. A short biography written by NMHS member Richard Harris. 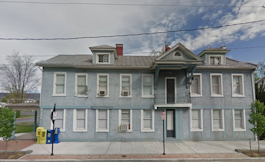 Mary, born March 21,1845 in Fayetteville, PA, died , July 4, 1933 in Luray, VA was the daughter of Ferdinand and Caroline Dobmarer Zeiler, resided at 9346 N. Congress St, in New Market, Va.
More information was provided by Chester Ramey, a descendant of Mollie and Lemuel Zirkle, to Betty Karol Wilson and is available by clicking "read more" below. On May 1765 Valentine Sevier and Johanna his wife sold to their 19 year old son, John Sevier, their home and the 378 acres of land (which had been granted to them by Thomas, Lord Fairfax 1 July 1749) Frederick Co. DEED BOOK 10, page 441. for 200 pounds. The Grace Brubaker Room in the New Market Area Library contains a wealth of knowledge for those interested in researching New Market area History or genealogy of area families. 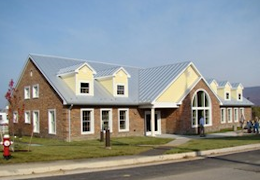 The library is located at 160 E. Lee Street behind the New Market Town Hall. 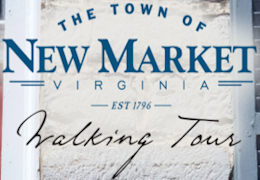 Come enjoy a scenic walk through our historical town with the Town Walking Tour Brochure and learn about New Marketâ€™s historical architecture and the stories behind the buildings where our downtown businesses are located.